The Augusta Futurity wrapped up Saturday, Jan. 24, with the 4-Year-Old Futurity Open and Non-Pro finals. In spite of the inclement weather in Augusta, Georgia, a crowd came out to support the East Coast cutters, and the competitors did not disappoint. From the first draw in the 4-Year-Old Futurity Open, High Brow Clay 012, ridden by Equi-Stat Elite $6 Million Rider Austin Shepard, of Summerdale, Alabama, marked a big 224. Though the rest of the 15 horse-and-rider teams tried to catch the score, none were able to surpass it. The next three duos after Shepard zeroed out, and later NRR Ollie Tom Cat, piloted by Equi-Stat Elite $2 Million Rider Tracy Barton, of Pierre, South Dakota, came from the seventh hole to land the second-highest score of the night, a 221. 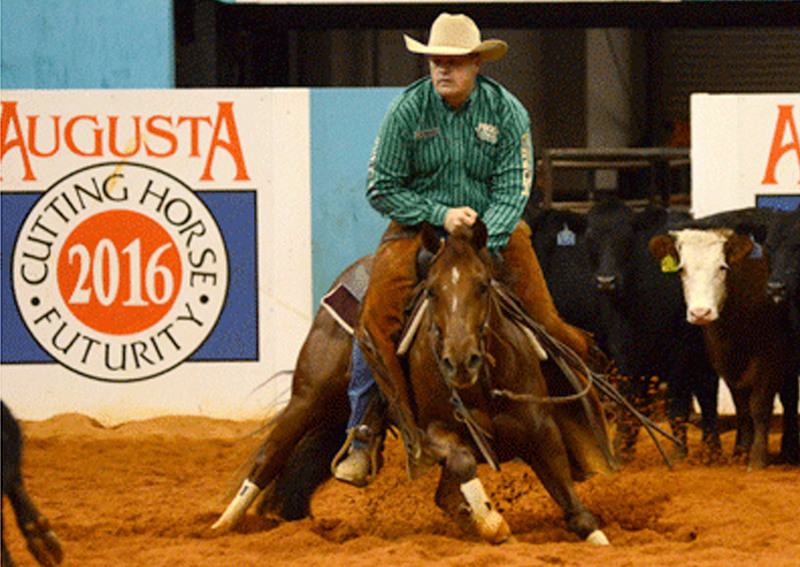 Barton and North Ridge Ranch Inc.’s black stallion (High Brow Cat x Uno Del Rey x Smart Little Uno) left the James Brown Arena with the Reserve Championship and $10,000, while Champions Shepard and High Brow Clay 012 received $12,000 for owner Plantation Farms LLC, of Denham Springs, Louisiana. This was the third year in a row for Shepard to win the title. He first time was on CD Kual Gun in 2014, and then he successfully defended his title in 2015 on Paradox Cat. “It feels good every time. It never gets old, I can tell you that,” he said with a laugh. Shepard remarked that High Brow Clay 012 (High Brow CD x Cash N Scooter x Cash Quixote Rio), who led the go-round coming into the Augusta finals, was one of his favorites going into the National Cutting Horse Association (NCHA) Futurity. Since he lost his first cow at the NCHA Futurity, he was happy to make the finals and have a chance to show the James Eakin-bred gelding. “He’s been a really good horse all along,” Shepard said.